I strongly recommend that you learn to properly profile your monitor and to use profiles for your printer and papers. Profiles will make the process much easier to get good prints; the monitor can be a very good representation of your printer output if you learn to use color management well. But the monitor is not a perfect proofing tool for your final print; it provides the first step for creating a good print, but once you have decent prints, how can you create the final exceptional print. I use test strips to allow me to easily evaluate the effect of minor adjustments to my prints; these allow me to quickly fine tune my prints to that one exceptional print. 1) First make the image look as good as possible on your computer monitor; then make the best print possible using your print process onto the specific printer and paper that you intend to use for your final prints. You should be able to create a print that is a fair representation of the image you see on the screen. From now on, the evaluation of your image will be on the prints rather than via the monitor. It is critical that all of you printing steps (profile, driver setup, printer & paper) remain unchanged throughout this process; as any small change will render the test strips useless and require you to start again. 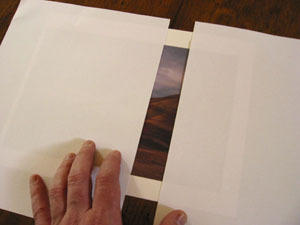 2) Evaluate the physical print under good light and determine some options for improving the print. Generally, these will be minor overall adjustments to the image’s color or tone. The steps for creating test strips work best for adjustments in brightness, contrast, color balance, or saturation; you can use test strips for any adjustment layer available within Photoshop. One adjustment that I commonly need to make is a set of subtle adjustments to just one color (ie. add a little saturation to the reds in the image); remember that you can use the Hue/Saturation adjustment and localize the effects to a specific color range by changing the Edit option to a specific color – you can then change the Hue, saturation, or brightness of just that color in the image. For my example image, I will be adding red to the overall image. 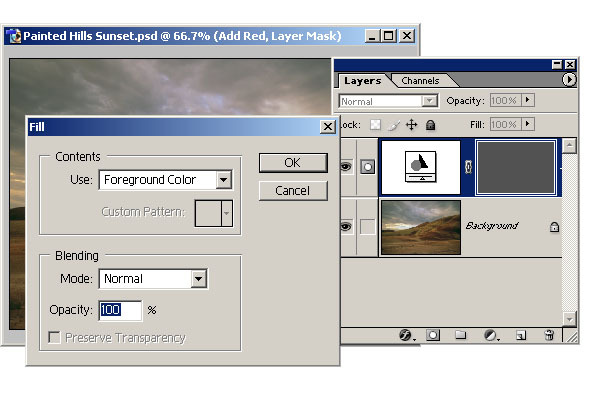 3) In Photoshop, create a new adjustment layer for the adjustment you are trying to achieve (ie. a color balance adjustment to add some red). 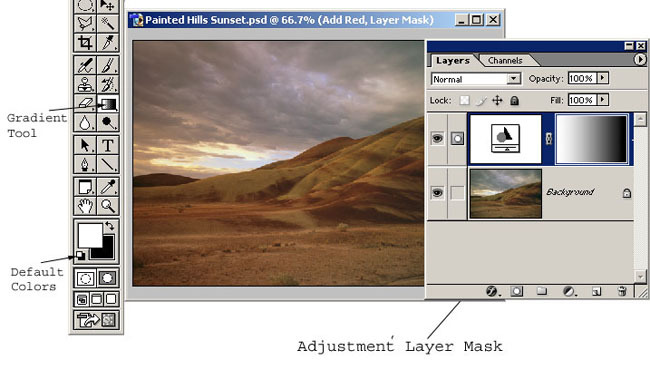 Select Layer/New Adjustment Layer/(an adjustment). Apply the desired adjustment to the image until it seems more than you would possible want for that image; ie. if you are adding red to the image, apply too much red; just like printing a test strip in the darkroom, you need to make sure you will print a digital test strip that goes beyond the desired adjustment. Hit Ok to accept this adjustment. Adding an Adjustment, make sure the added adjustment is too strong. 4) Now the adjustment has been applied to the entire image; and the effect will be too strong if printed. We now need to make a test strip that applies this effect in steps from no adjustment up to the strongest adjustment. 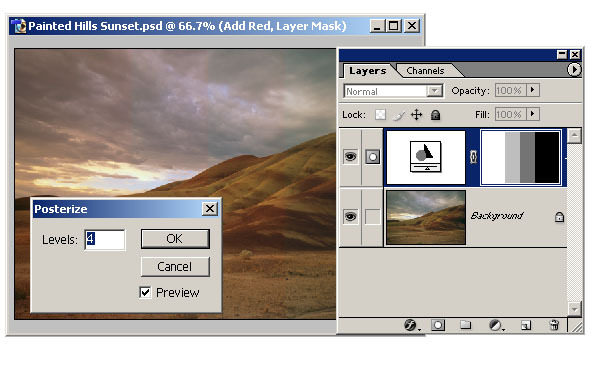 Make sure that the mask is selected for the adjustment layer; the title for your image window will show the name of the adjustment layer and ‘Layer Mask’ in parentheses (here ‘(Add Red, Layer Mask)’) . Then select the gradient tool, and click on the default colors icon to set the colors to black & white; hitting the ‘D’ key on your keyboard will also set the default colors. 5) Using the mouse, click and drag a line across your image; do this on the image itself. This will paint a gradient from black to white on the mask for the adjustment layer you just created. This mask will cause the adjustment to be applied in a gradient across your image. You could drag the gradient either vertically or horizontally depending on the direction of the test strip you desire. You image now has an adjustment that is masked so the image is unchanged on one end of the image, and too much adjustment is applied to the other end. The ideal adjustment lies somewhere within that gradient. 6) We can leave the adjustment gradient as is, or convert it into discrete steps. 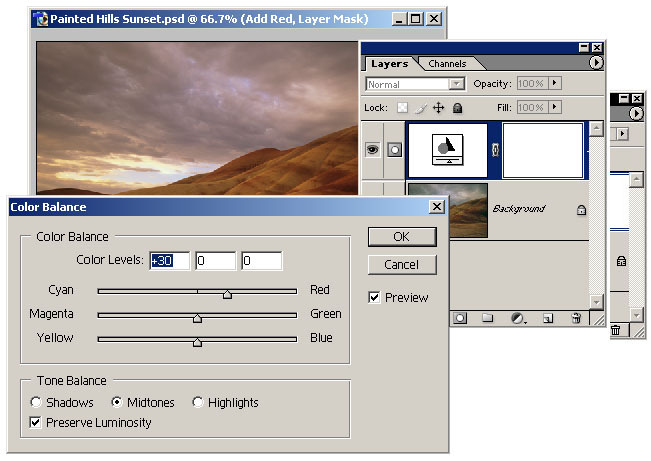 To convert the gradient into steps just select the adjustment layer masks, and posterize it; Image/Adjust/Posterize. In the Posterize, just enter the number of steps that you want on your final print, 4-8 works fine here. I typically do not posterize the test strips, but many people prefer the discrete steps that it creates. 7) Now you have a test strip, print it as you printed your original final print. The precise evaluation of the image and the test strips needs to happen by reviewing the print itself. 8) Take a close look at the print and determine the test strip that provides the best overall result for the image. Again, I evaluate my digital test strips in the same ways as I evaluate my darkroom test strips; I use two white sheets of paper to localize each strip and help determine which strip I prefer. In the unlikely event that I like one of the strips on the end (either the least adjusted or the most adjusted) – I will need to return to the adjustment layer in Photoshop and either increase the effect of the adjustment or decrease it and print the test strip again. 9) We will now convert the adjustment layer mask so that the adjustment for the preferred strip applies evenly over the entire image. 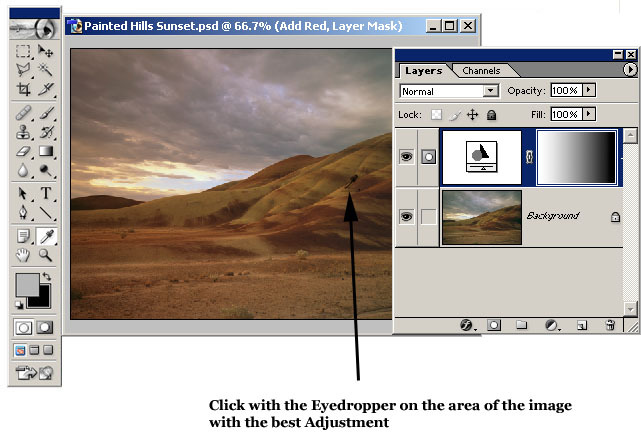 10) In Photoshop, select the eyedropper tool and make sure the adjustment layer mask is still selected. Position the eyedropper tool within the area of the image covered by the strip that produced the best adjustment in the print. Click with the eyedropper tool on the image. This will change the foreground color in Photoshop to match the gray level in the adjustment layer mask for the test step. 11) Fill the entire adjustment layer with this gray level; Edit/Fill and set the Contents to Use Foreground Color. The mask is now a single value everywhere throughout the image. 12)	You should now print the image again and examine it carefully. 13) If necessary, go through this entire process again with a different adjustment. Experiment with a few adjustments to produce the best print that you can, this is the final step for producing your final print. 14) Once you have produced you final print. Save the file, and make sure that you save all the information about the final print settings for that file. I typically write all the appropriate settings on the back of a proof for the final print; including the filename for this print, the profile used, paper and printer settings. 15)	If your print is fairly large (8”x10” or larger), you may want to make it smaller temporarily just to make the test strips. Use Image/Image Size to make the image something that will print faster and use less paper & ink; I suggest something like 5”x7” works well. Make sure that the Resample option is not selected, this will ensure that no sampling artifacts appear in your image. You will not be printing your test strips at the ideal printer resolution, but for test strips this is not an important issue. Restore your image to its full size to make your final print. Remember, you can create a test strip for any type of adjustment available as an adjustment layer within Photoshop – you can choose options that are well beyond those that were previously available in the traditional darkroom. 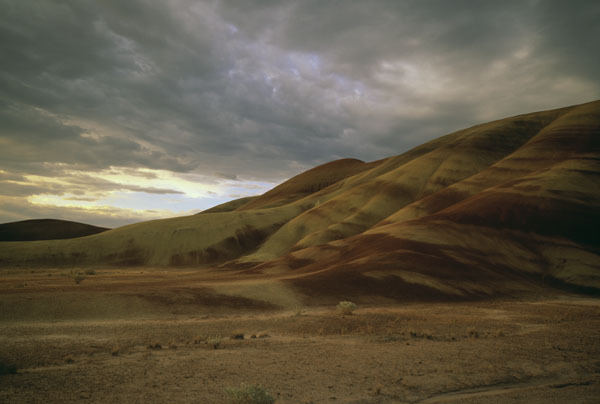 Common options include adjustments to add minor amounts of contrast (using a traditional S-curve), to add shadow detail (using curves), to add saturation to the one color (using Hue/Saturation), or dozens of other options.